Situado en un edificio pequeño con patio pavimentado en viejo estilo, entrarás en este apartamento tranquilo y soleado, que no falta de encanto. 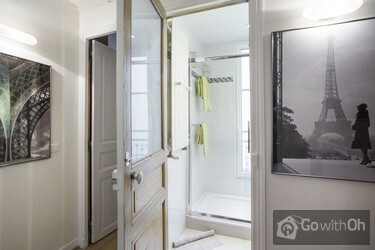 Cuenta con una entrada, una sala de estar con sofá cama doble y zona de comedor, una cocina totalmente equipada separada por una puerta corredera, un dormitorio con cama de matrimonio y un cuarto de baño con ducha. Todo el apartamento da a dos patios diferentes. Este famoso barrio, popular entre los parisinos es activo tanto durante el día como de noche. Ofrece numerosas tiendas, bares, restaurantes y salones de té y podrás disfrutar de un brunch los domingos. No te pierdas el mercado de Montorgueil que tiene lugar todos los jueves y domingos por la mañana a los pies de la iglesia de Saint Eustache. Es el lugar ideal para vivir y explorar París. Podrás caminar hasta el barrio del Marais, la Catedral de Notre Dame, el Museo del Louvre o el Centro Georges Pompidou, por ejemplo. Diferentes paradas de metro están cerca: Etienne Marcel (línea 4), Sentier (línea 3) o Réaumur Sebastopol con estas dos líneas. Châtelet-Les Halles se encuentra a pocos minutos a pie con una multitud de metro y conexiones RER. El apartamento no está equipado para albergar bebés, razón por la cual el propietario no aceptará reservas de familias que vayan al apartamento con un bebé. A perfect accomodation with that little extra perfect located. The only minus was the neighbours who could see right in to the apartment. eine sehr schöne und super gelegene Wohnung. Direkt an der sehr belebten Rue Montorgueil und in Fußentfernung zu beinah allen zentralen Sehenswürdigkeiten. Da die Wohnung im 2. Hinterhof liegt ist es trotz der belebten Straße idyllisch ruhig. Für vier Leute ist sie zwar nicht besonders groß, aber trotzdem sehr zu empfehlen! Ce petit studio est joli, bien équipé, et surtoût très bien situé. Il est aussi un peu cher pour ce que c'est. Nos ha encantado, superlimpio muy coqueto y muy bien situado. El barrio es muy chulo, merece la pena perder una tarde por esa zona y mezclarse con los parisino de ese lugar. Solo hay un pero, como tengas un vuelo de madrugada, tienes un gran problema por el tema de que te devuelvan la fianza. ...Esta se debería devolver por transferencia y las llaves dejarlas en un buzon. Si el apartamento no está en las condiciones que se entregó no se devuelve fianza y punto. Por lo demas, fantastico. Muchas gracias a la chica que nos recepciono, porque de no ser por ella hubiéramos tenido que dejar el apartment una tarde antes de lo previsto. 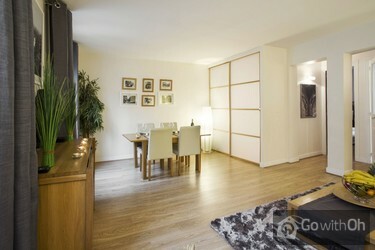 It would be quite small for four people, but otherwise a great apartment in a great location. I recommend highly. Si trova in posizione strategica!! wonderful location. 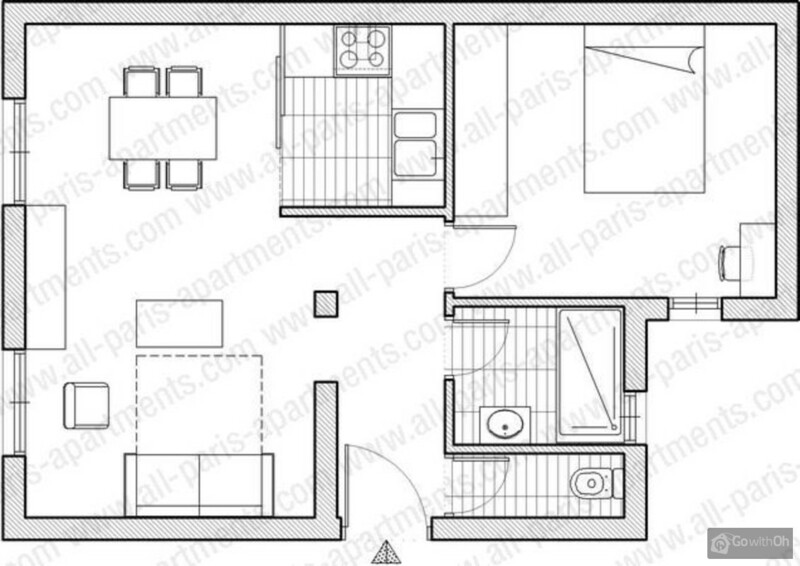 Apartment in very good conditions, very confortable, fully provided. a real plaesure. contact person absolutely excellent. highly recommended. this was our first time with All-Paris-Apartment. excellent service. highly recommended. The location is perfect. We are a family of four, age 52, 51 19,16, and the flat suited us very well. Die Wohnung war sehr Sauber, Rühig, Super Lage und mit allem sehr gut ausgestattet. 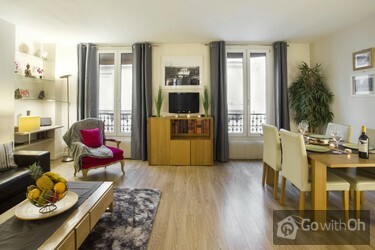 Todo estuvo perfecto.- Muy recomendable tanto el piso como all-paris-apartments.com. The apartment was exactly as described on the website. 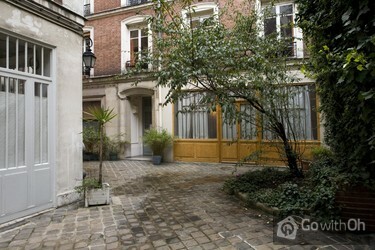 It was off a quiet courtyard which opened on to a very busy and entertaining Parisian street. The contact person was very helpful. Everything went according to plan, no problems. Location, location, location! I perfer this part of Paris! Excelent for bussines and pleasure! The apartment its very nice and comfortable. Very nice, lively and trendy location. Quiet appartment! Good bed. Friendly welcome. But given the price range of E200 a night the plumber work should be ok. The bathroom (e.g. shower) doesn´t work well. very well located, clean, quiet. 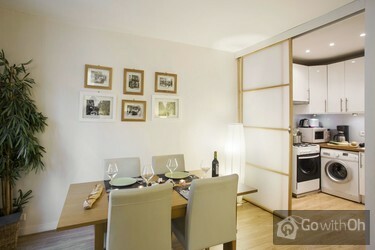 Rue Montorgueil is a charming place to live to enjoy Paris. Very good too for business man tired of staying in hotels...for a fraction of the price. Semplicemente fantastico! Dall'arredamento alla pulizia... alla posizione strategica in una delle strade più incantevoli della città, dalla tranquillità del posto alla gentilezza di chi ci ha accolto... una vacanza perfetta. Nice appartment!! The position is very good, near the important street, monument and museum. I have spend a very beautiful holiday!!!! 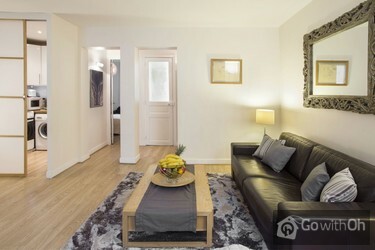 The apartments is very comfy and well-appointed and, above all, is located in the perfect position to visit the wonderful city of Paris, close to the most important places of interest and also to the metro and rer stations. Still, it is very quiet and peaceful during the whole day. The contact ...person was really nice and helpful; she gave us good advices on what to visit and on how to reach different places around the city. Also, she quickly fixed a little problem we had with hot water that was brought back soon. 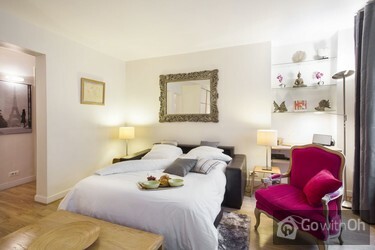 We would definitely suggest this apartment to our friends visiting Paris and we wish to come back one day. L'alloggio era perfettamente corrispondente a quanto descritto,tutto era pulito e ordinato. 8/10 à cause de quelques problèmes ménagers mineurs, mais quand même contrariants, pour le reste, c'est un 10/10! Accueil chaleureux. Emplacement idéal. Muy bien situado y coqueto. Algún problema con el termo del agua pero al final lo solucionamos. Wohnungslage und Ruhe sind tipptopp. Ein Hinweis: das Bett für 2Personen ist schmal und geht höchstens für Paare, die eng zusammen schlafen können. Zusammen mit Sofa für 4 erwachsene Personen nicht wirklich ausreichend. Leider gibt es keine Garderobe für Mäntel aber sonst waren wir ...ausgesprochen zufrieden, besonders mit der ruhigen und zentralen Lage und moderner Ausstattung und den Kontaktpersonen! Vielen Dank wir werden Sie weiterempfehlen und gerne wiedermal auf Sie zurückkommen. La casa si presentava esattamente com'era descritta dal sito, molto carina, in una posizione incantevole (la strada sotto casa è piena di negozi, bancarelle, c'è tutto quello di cui si ha bisogno!). La fermata della metro è vicino casa, passa anche la RER B che collega in 30 minuti con CDG. ...Unica piccola pecca, ci è stato fornito un solo mazzo di chiavi e nonostante la richiesta del secondo non siamo stati accontentati. Comunque vada esperienza molto positiva. The flat was all that I had expected. We had a problem understanding how the appliances worked. We contacted the contact person and he came by very soon after I called. We forgot to ask about the clothes washer but we didn't need it anyway. It was all good espcially Location was so perfect in Paris. De ligging is prachtig. Hartje centrum en toch echt heel rustig. Sfeervolle inrichting en alles prima voor elkaar. The apartment was very nice & so close to everything. We enjoyed our stay very much & will be recommending to all. the only problems we had was the dryer wasn't working so we had to go the Laundromat to dry our clothes off. Also because it was quiet warm when we were there a fan in the bedroom ...would have been nice it was a bit stuffy at night. The correspondence leading up to our arrival was great we felt very confident that all was going to be good, & it was. The gentleman who met us was on time &very friendly & helpful. We very impressed with the location as we could easily walk to the Seine River & jump on a Hop on Hop off bus for the 2 days we were there. Even though the apartment was off of a busy little street it was set back & was very quiet. Loved it! 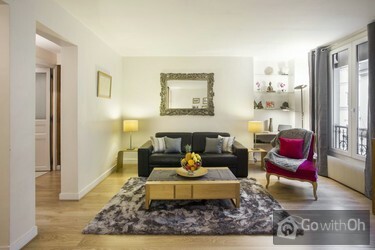 Great location, beautiful apartment, an oasis of calm in a very busy street. This apartment was fantastic as we walk from there to all other tourist site within 15 to 30mins, my two boys aged 6 & 9 loved the short walk to Louvre and notre-dame and with longer walk we stopped at pastry shops for break and for those lovely cakes. 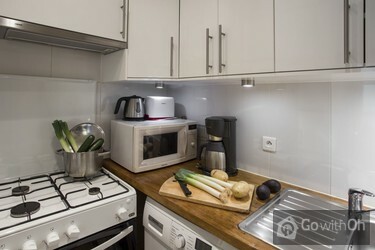 The apartment and the location was just ...perfect for us, everything we need is just downstairs and within 3 minutes walk to all shops, metro and food, fresh food market was perfect for our evening cooking and cost saving from restaurant food. 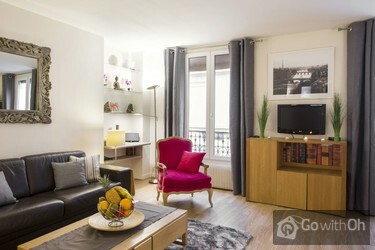 We will definitely return to this apartment if we do have the chance to return to Paris. Our contact T. was there within 20 minutes of our arrival, the service was simple and easy to deal with. 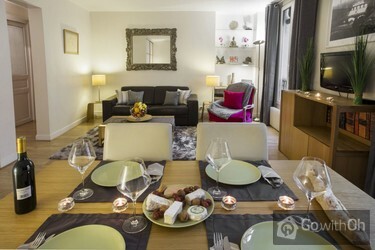 Apartement très agréable dans un très beau quartier. La réservation ainsi que la remise des clés ont très bien fonctionné. Die Lage im Marais direkt an der rue Montorgueil, also mitten im Leben, ist ideal, alle Shoppingmöglichkeiten sind gegeben und auch für Nachtschwärmer toll gelegen. Appartement liegt im Hinterhof, dadurch ist ein erholsamer Schlaf garantiert. Zweckmäßig eingerichtet für 2 bis 4 Personen. Sehr... bequemes Bett im Schlafzimmer, das Couchbett im Wohnzimmer hat weiche Matratze und ist eher für 2 leichte Personen geeignet. Wir haben zu viert vier tolle Tage verbracht. We will be staying here again ! 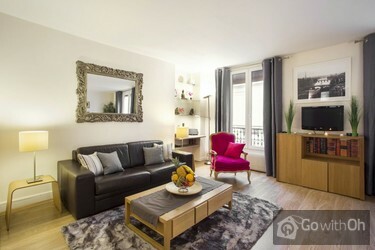 Just back from an Easter break of 3 nights 2 adults & 2 kids in this lovely apartment and suberb quiet location right in the heart of Paris 2. Its bright clean and modern contemporary furniture, local shops bars and restaurants are perfect for a gourmet break. The ...local patisserie Stohrers a real gem providing the fresh smell of breakfast baking each morning. The owner was helpful and met us on arrival with all the necessary details and available to help Highly recommended for a convenient comfortable base to explore Paris or just relaxing with a coffee and good book. Wohnung liegt mitten in einem belebten Quartier gegen einen Hinterhof und ist absolut ruhig. In Gehdistanz sind viele Highlights von Paris zu Fuss erreichbar. Die Wohnung ist sehr geschmackvoll eingerichtet, das eine oder andere ist aber etwas "schlecht im Schuss". Bettsofa und Doppelbett sehr bequem. Würden jederzeit wieder diese Wohnung buchen. 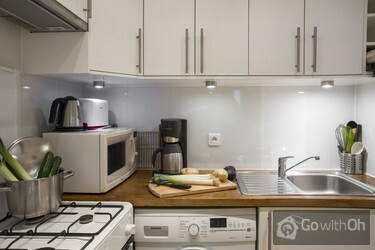 El apartamento está en un lugar muy bueno, muy bien comunicado con 3 paradas de metro relativamente cerca. El edificio es muy silencioso y tranquilo y la calle en la que está tiene mucha vida.El único inconveniente es que la limpieza del apartamento no es muy buena. Debajo del sofá-cama en el ...que durmieron mis niños, había de todo y la cocina tampoco estaba muy limpia. it was great! My wife said that the owner was friendly. 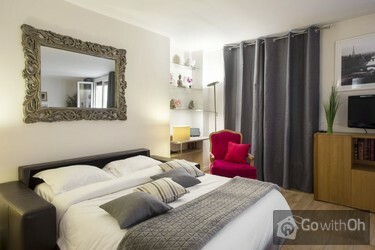 However, the location is the best, smack in the middle of Paris, just great! Logement bien équipé, propre, chaleureux et calme pour notre séjour pendant l'un des nombreux pont de Mai en France. Attention seulement aux rideaux dont la tringle est mal fixée :)Accueil professionnel de l'agence en charge de la remise des clés, sans stress pour notre arrivée (pas d'attente ...! 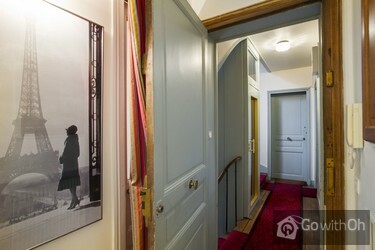 )Nous connaissions le quartier donc bien entendu pas de surprises, que du bon pour les visites avec nos deux jeunes enfants (quartier central et tout ce qu'il faut pour passer de bons moments à proximité)Nous reviendrons à cette adresse lors de nos futurs passages parisien. 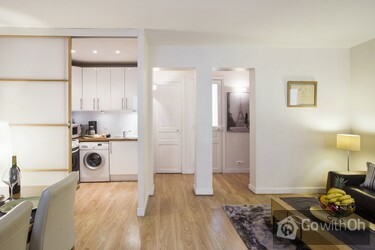 A lovely spacious, quiet, pretty apartment hidden in a courtyard off the wonderful pedestrianised Rue Montorgueil an excellent vibrant location with restaurants, cafes, bakeries, coffee shops. 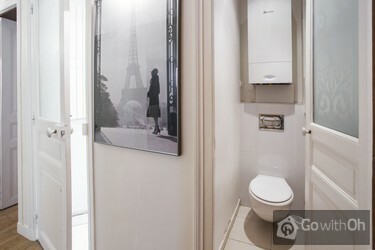 Easy walking distance to many famous Paris sights. We would definitely stay again. I would recommend this apartment to friends. We had a fab stay, location was excellent, my kids had a fantastic time.... This apartment highly recommended! Il contatto fornito non era di immediato reperimento. Al momento della prenotazione veniva offerta la possibilità di usufruire della lavastoviglie, ma al nostro arrivo risultava non funzionante già da qualche settimana (la lavastoviglie non è un optional da poco ed era uno dei nostri criteri di ...scelta). Nel frattempo ci siamo poi accorti che sul sito, e senza informarci, la lavastoviglie non veniva più data come disponibile, doppiamente scorretto . All'arrivo non abbiamo potuto utilizzare la doccia perchè era intasato lo scarico.Peccato l'appartamento è molto silenzioso e ben ubicato, il prezzo pagato non corrisponde però alle aspettative, per quella cifra alcuni standard di base, li davamo proprio per scontati, è stata una delusione e una seccatura. Gentile Cliente, Da Oh la ringraziamo per la sua recensione. Siamo profondamente spiacenti che non abbiate potuto usufruire della lavastoviglie durante il soggiorno: le informazioni sulla descrizione sono state aggiornate. So much to do right outside the building, really convenient to everything. When we couldn't watch the world cup game on tv, we went to a bar just out on the street which thankfully had it on! Located off of a courtyard and far from the nighttime noise. Met apartment owner as scheduled, he was ...friendly and that part was easy. The apartment is very nice, but had a few issues like falling curtain rods and a broken towel bar. Did not feel quite as clean as a hotel room, but rather like we were using someone's apartment, which we were. Could use some paper towels and tissue, an ice cube bin, and some extra pillows! I really would have liked it if there were flowers in the window boxes instead of nothing. The courtyard is charming. We enjoyed our stay very much and would love to come back. Low traffic neightbourhood, many good places to eat. EL APARTAMENTO ESTABA MUY BIEN Y MEJOR SU LOCALIZACION, LO UNICO NEGATIVO FUE LA FALTA DE UN PERCHERO PARA COLOCAR LOS ABRIGOS Y UNA SILLA PARA LA ROPA EN EL DORMITORIO. The location is great, secluded courtyard opening up into a bustling street, wonderful experience and very central for what we wanted to do. Great Cafe's, restaurants and shops so near...Definitely would go back! Dear customer, we appreciate and value your feedback. The owner regrets any inconvenience caused by the construction and confirms that it was a specific job that has already been finished. The accommodation is only 3 stars. The dishwasher was broken and in the bathroom 2 from 4 electric bulbs were broken. Last but not least there was no noise from the street but from the RER in the underground, especially in the night. There were no problems during the booking process, but the ...check-in was a little bit strange due to the vigorous behaviour of the young lady. Dear customer, we appreciate and value your feedback. We confirm that on our website we have mentioned that the dishwasher is not included in the apartment equipment available for use during clients stays. 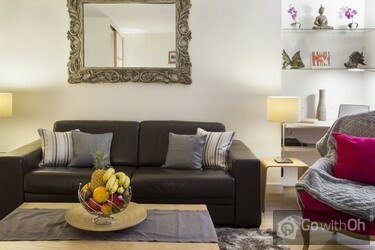 Apartment is very clean and located at one of the best marche! You can get everything on that street, grocery, restaurants, bars! I will definitely wanna stay here again for my next visit!! thing but also things I didn't like was: Washing machine is like 100years old (was told owner is thinking to ...get new one) and fridge is also old, it makes loud sound and freezer seems stop working .... Which makes me carry cheese without icepacks in 35degrees :(((((( and threre was only small (short) ironing board, it will be great if there is the standing one! And hopefully there is full length mirror! but other than that, everything was perfect! Sehr geehrter Gast, vielen Dank für Ihre Rückmeldung. Der Eigentümer bestätigt, dass der Kühlschrank korrekt funktioniert und die Waschmaschine im Juli 2015 erneuert wurde. The apartment was exactly as depicted in the photos - pleasantly decorated, reasonably spacious and with lots of cooking utensils. We had three of us and didn't feel cramped. The location was amazing, ten minutes walk from the Louvre and the Seine and located just off a lively food and restaurant ...precinct. The owner was helpful and friendly and waited for us even though we were delayed. You can catch the train from CDG airport to the RER station at Les Halles/Chatelet and it is a few minutes walk from the St Eustache exit. 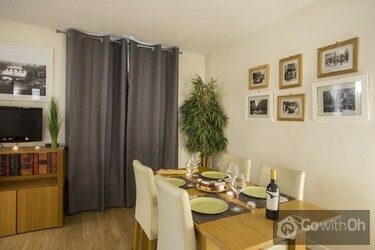 I'd thoroughly recommend this apartment and wouldn't hesitate to stay there again. Excelente departamento que cubrió nuestras expectativas. muy bien equipado. Toallas y sábanas de calidad. Precioso barrio, con todo el espíritu de Paris. Muy amable la persona de contacto. The location was fantastic - close to the markets, shops and restaurants and Metro stations and attractions.Although on a busy bustling street, the apartment was very quite situated on the back of the building overlooking courtyards.Apartment was clean and roomy - very comfortable for three guests. ...We would have loved softer pillows - all the pillows were extremely hard and uncomfortable.There were three light bulbs in the kitchen over the counter that need replacing and one in the hall over the Eiffel Tower pictures. Also the curtain rod in the bedroom is broken and needs replacing. 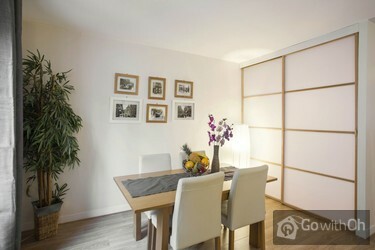 Better lighting in the dinning area would be an asset.Overall we thoroughly enjoyed our time in Paris and would definately stay in the apartment again and will recommend to friends. Dear customer, we appreciate and value your feedback. The owner confirms that they have replaced the light bulbs. We inform you that in these types of cases, or should there be some kind of incident that occurs during the stay, the owner is available by phone and email to offer immediate assistance to clients. The pull out couch definitely needs to be replaced! Big "wow" in the middle, Not enough toilet paper in apartment! Chair near pull out couch also needs to be replaced badly! I know we arrived late, due to flight delay, but owner could not get out of there fast enough after giving keys! Was not ...shown how oven worked, could not use it! Very nice location,! Dear client, we appreciate your comments. The owner confirms having reviewed the sofa bed, which is in good condition. He also informs that the check-in agents always spend the necessary time to make the check-in, give appropriate instructions and answer the questions the guests may have. Great location in a busy street yet the apartment is quiet and the courtyard makes it peaceful. Loved the Christmas tree in the passageway from the street. The small lift is a wonderful sight after a day in the city. Friendly welcome .